Corsham Digital - Alarms/Security, TV Aerials/Satellite Services based in Corsham, Wiltshire. 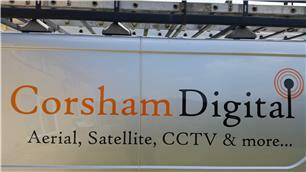 Corsham Digital is a company specializing in aerial, satellite and CCTV installations. No job is too small or too large, from TV links, service calls, repairs and extra TV points to full communal systems. The other services include: bespoke TV wall mounting, including chasing out the walls, hiding the cabling then bonding and re-plastering (the only thing I don't usually do is the re-decorating! well? If you ask nicely I might!) I also run and terminate network cabling (cat 5 and cat 6) around your house for either HDMI distribution or just to create a direct internet link to media devices ie, smart TV's, laptops or PCs. When you use Corsham Digital, your satisfaction is paramount! You are charged what you are quoted and there are no hidden extras (if there are extras required, you will made aware of any additional charges before any work is carried out) and all work carried out is guaranteed for 12 months for extra piece of mind.